I almost let the month slip by without posting a squirrel photo. So here's one that I actually took a couple of months back from our sliding door. 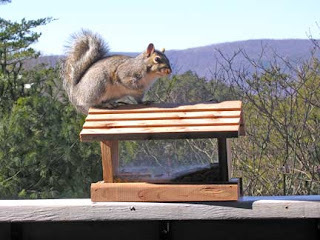 I've stopped feeding the birds on our deck because the squirrels were becoming too accustomed to visiting the feeders. They were starting to glare at me when the feeders were empty and I figured they'd soon be pounding on the door with their little fists! I still fill the bird feeder down in the yard though - that's where the little rodents belong, not on our deck. In fact I saw a chipmunk down there today. The last stop on our recent field trip was Camp Allegheny, site of a Confederate camp which was attacked in December 1861. It is just about on the West Virginia/Virginia state line. For an nifty road guide of the area see this page at MileByMile.com. Our field trip stopped at Bartow to see the site of an 1861 battle. 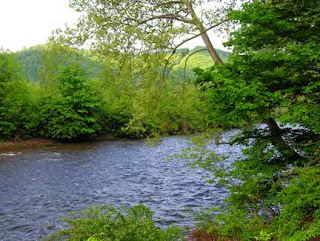 On the left is a photo of the Greenbrier River that I took from US Route 250. We followed 250 for a large portion of the trip. Here are some of my fellow travelers on Cheat Mountain Summit. I've always liked the mountains of West Virginia. 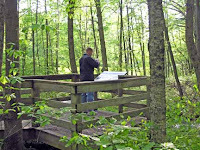 When I was little, my parents took us to various state parks there. We'd stay in a cabin for a week or so. This was before my dad bought a tent and other camping equipment. These Civil War earthworks have been eroding since 1862 but you can still see what remains of their contours. 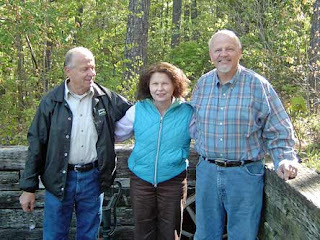 Our professor and his wife had previewed the tour two weeks before, and Betty said that at that time Cheat Mountain Summit was pretty much black from a forest fire. 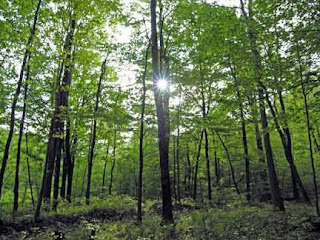 However, Spring had brought green growth to cover some of the charred earth, but you can still see black evidence of the fire. The signs survived but looked a bit cloudy and scratched. 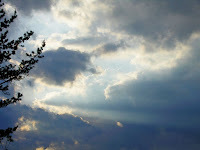 This blog carries a certain amount on one page and then throws the old posts into the archive. Links to the archive can be seen on left, part-way down the page. Click here for all posts for May 2007 including other West Virginia Field Trip photographs. Also, there is a search box at the top of the page which will search all my blog posts. This is the place where Confederate General Garnett was killed in 1861. He was the first general killed in the American Civil War. 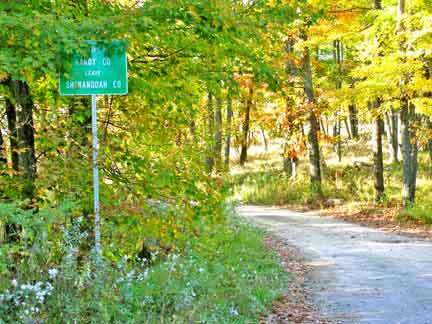 There is a paved trail from Parsons, WV to Corrick's Ford. It's on Shaver's Fork. 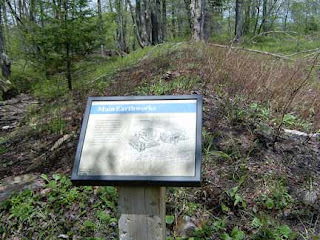 If you want to see an area map, click on the image to the left - it's from a Civil War Trails sign at the site. Saturday's library lecture (organized by Frank) was a big success. John Adamson shared dozens of photographs taken by Hugh Morrison, Jr. between 1898 and 1950. The Shenandoah County Historical Society acquired about 28,000 glass plate negatives by Morrison in 1999. Volunteers have done an incredible job cleaning and scanning a substantial number of these. 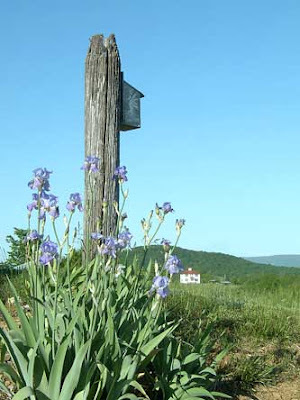 The pictures show scenes in and around Woodstock (Virginia) and portraits of numerous county residents. Researchers can see the finished prints in binders at the Shenandoah Room in the library in Edinburg, VA. There are forms for local residents to fill out if they can identify people or buildings in the photos. That library is just off I-81 and it has an impressive collection of genealogical resources. A week ago at 7 AM, our class started the day with a lecture in front of our motel in Elkins. This isn't our earliest starting time ever; last year we met at Hawk's Nest parking lot at 6:30 AM! Both of these field trips followed the struggle for West Virginia in 1861 as detailed in Dr. Poland's book The Glories of War. These signs are popping up in the valley and they puzzle me. How do they define win? Since Saddam is not only deposed but dead, and the weapons of mass destruction turned out to be fiction, didn't we win the war a long time ago? 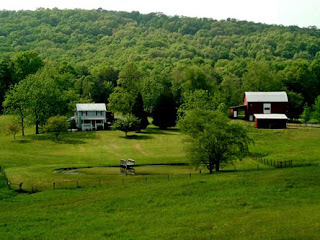 Camp Garnett is in West Virginia's beautiful mountains near the town of Beverly. 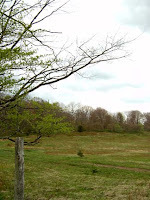 In July 1861, Union troops under General McClellan routed Confederates who had made this their fort on Rich Mountain. 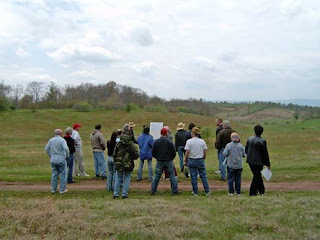 From the sign: "Confederates built Camp Garnett to block the Staunton-Parkersburg Turnpike. Soldiers here felled trees, dug trenches and stacked rocks for protection. Fortifications covered the hills overlooking the road, forming a fearsome obstacle for General McClellan's army." I enjoyed the audio book "Gone for Soldiers" by Jeff Shaara. It was an effortless novel to listen to and I finally got a picture of the United States Military Experience in the Mexican War. My particular interest was where crossed the paths of future Civil War officers, such as how Lee met Grant and why he remembered him at Appomattox many years later. 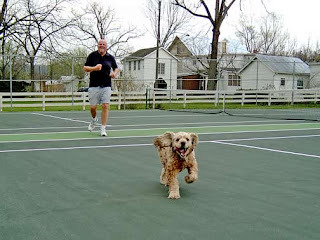 "The Well-Mannered Dog" covers basic dog training and gives some special tips on traveling with dogs. Much of it is basic but I need all the help I can get with Ben's barking. 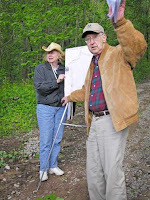 Saturday in West Virginia: Dr. Poland tells about the Battle of Rich Mountain while his sister-in-law steadies the flip chart. The 1861 battle was a Union victory and General McClellan received credit for it, gaining fame and a step toward additional leadership. The road pictured below was a well-used trade route. Today it's basically used by travelers who want to see the battle site. Microsoft is discontinuing their bCentral email list service, so Spiritual Singles must move their events list. They use it to send out a calendar every month. As their webmaster and (part-time) list manager, I recommended that they just use Yahoo Groups. Yahoo doesn't charge for this service, which is helpful to a small not-for-profit group like Spiritual Singles. Anyway, so now I'm putting their members on the new list. Non-members can join the list here at no charge although they have to pay a fee to attend events. 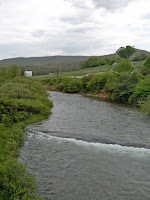 Philippi was the site of one of the first land battles of the Civil War. 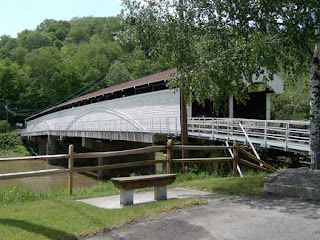 It is located along the Tygart River and has a famous covered bridge that is still in use. The old train station is now a museum which is free to visit unless you want to view the mummies, for which you pay a fee of one dollar. If you go there, don't miss the photos of the 1985 flood - scarier than the mummies, I'd say, except that I didn't see the latter. 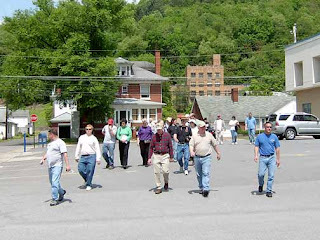 Here's our class returning from a short walk to see the site of the first amputation of the Civil War. The unfortunate soldier who had his leg amputated was an engineering student who went on the develop an artificial leg and began a company which manufactured artificial limbs - and it's still in existence! The small museum was staffed by a couple of helpful people, one of whom was an animated lady in a flowered hat. 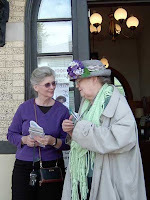 Here you seeing her talking with a member of our group. 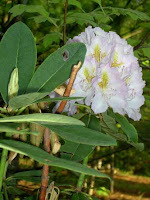 I've always loved rhododendrons, associating them with fresh mountain air and the Blue Ridge in the spring. 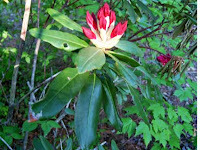 So I was delighted to discover large red, pink, and white rhododendrons growing in our yard. 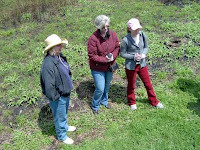 We also have dogwood, irises, and daylilies courtesy of former owners. And maybe more flowers will show up as summer comes. This hasn't stopped us from buying more flowers and planting them though. The community library here in Basye, Virginia will hold a used book sale on Saturday from 10 to 4. Hundreds of books will be offered. Most were donated by patrons so they cover just about every type of fiction and non-fiction that you can think of. The library is on Resort Drive next to the landing strip. They actually sell used books all the time in the back room (and you get to name your own price! ), but this book sale will include additional titles brought out just for the occasion. 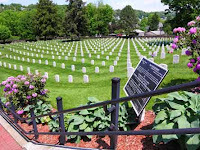 This was the first national cemetery in West Virginia. Among the soldiers buried here is the first military casualty of the Civil War (not including Col. Ellsworth, who was killed by a civilian in Alexandria). 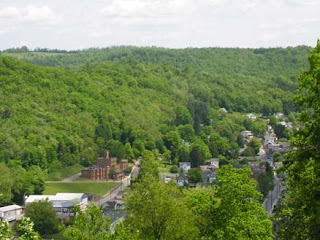 I had a field trip Saturday through Sunday and the starting point was Grafton, WV. 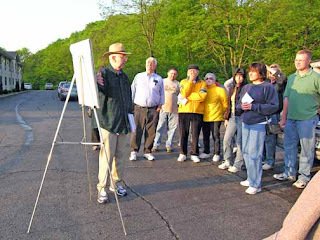 When I made this Civil War tour in 1999, I drove there using I-70 and I-68 for most of the way. 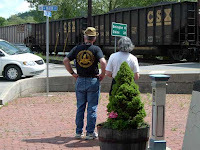 But we've moved since then and that route would take us far out of our way, so I searched for the best route across West Virginia. Four online mapping services say to drive to Winchester and then take US 50 west to Grafton - simple, but I had just been over Route 50 from Winchester to Romney and found it twisty and slow. Google Maps took a novel route - straight over Great North Mountain on Crooked Run Road, then winding around on small roads to WV 55, right on US 220 to US 50 (catching it west of Romney), then left on 50 to Grafton. As cool as it is to imagine unsuspecting travelers snaking their way up narrow and steep Crooked Run Road, I didn't know how long it would take. We once took that road to the top of the mountain to see the view from the radio towers, and I remember slowing down at the hairpin turns and listening to see if anyone was barreling down toward me, because if they didn't stay at their edge of the road they might hit my car and push it over a cliff! And my co-pilot really dislikes traveling that kind of road, so I ruled it out this time. 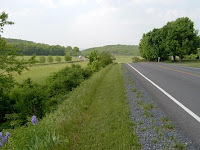 However, I liked the idea of traveling WV 55 because I'd heard that a new super-highway portion was open west of Wardensville and I wanted to see it. So I went to Wardensville via civilized roads which were familiar to me: Alum Springs Road, Back Road, and VA 55 (which turns into WV 55). The new part of WV 55 did not disappoint: fresh and modern and fast, elevated over the valleys so that you skim over the mountain ridges with little effort. For now, it ends at Moorefield. There we followed Google's Route up 220 and left on 50. Soon after that I wished I had made a pit stop in Moorefield because there are few facilities between there and Grafton. Finally stopped at a gas station that had a chemical toilet and a tiny store but no decaf or lemon pies. Even with only the briefest stop, the journey took almost four hours. Route 50 goes up and down an infinite number of ridges, weaving back and forth and forth and back. "Are we there yet?" I asked -- and I was driving! If I had to drive to Grafton again, I think I'd make my way south to US 250 and take it all the way there. It's a very pleasant road. 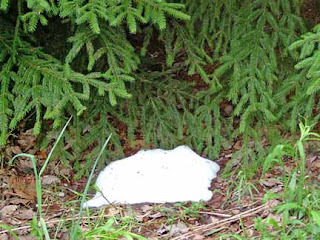 It wasn't a lot of snow, just some patches in the shade. 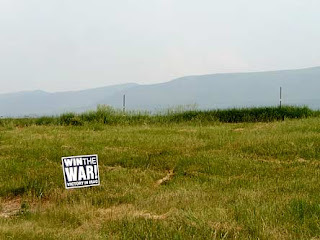 And it was on Cheat Mountain Summit in West Virginia, site of Robert E. Lee's first offensive of the Civil War. Follow their link to the fascinating interview and then go to www.healthycar.org for more information. 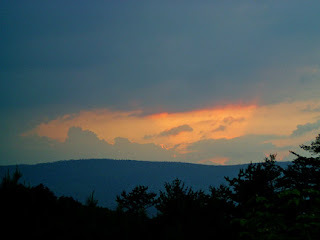 Okay, I'm probably boring readers with all my pictures of clouds and sunsets. So I'm publishing this one a little bit smaller. If you want to see it larger, just click on it. This little video is the first one Frank took with his digital camera. He did not know whether the video button was working so the results look unprofessional, to put it mildly. But I love remembering how Guppy enjoyed jumping in and out of the river. He would do it over and over. The locale was a community beach at Glebe Harbor near Montross, Virginia. My dog Guppy has gone on to doggy heaven. He was fifteen. We will really miss him. Before he departed he slept almost all day. The vet said his white blood cell count went higher instead of lower in spite of the antibiotics. When I tried to rouse Guppy this afternoon, he barely opened his eyes, lifted his head slightly, and gave just one small wag of his tail. Then he went back to sleep. Now he has gone and he is released from his health burdens and declining strength. 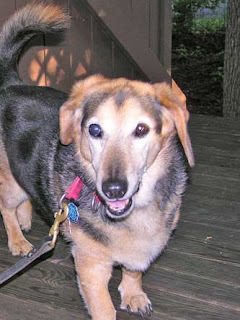 Guppy, thank you for all the years of companionship and for being such a great dog. We love you. I had to cut Guppy's dose of phenobarbital in half because it made him totally groggy. We took him to the vet today and she put him on antibiotics because his white cell count was high. She is very concerned about him. So are we. Right: Mauzy, VA: The old jail has been turned into a store. 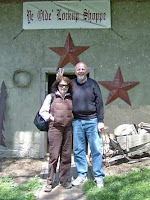 Is big brother holding up bunny ears? Some things never change. Below: Taken in our driveway just before Bill went back to Pennsylvania. Listen for the clucking of this large woodpecker as he swings around on a suet feeder. The suet cage is suspended from a spring with the idea that squirrels can have fun swinging around on it. In the distance is the old school in Forestville, VA. It has been fixed up by the Ruritans and they use it for their meetings. Across from the school, by the way, a large sign has been posted in front of Forestville's mill designating it as a historic site. The sign will make it much easier for motorists to spot the mill -- it is off the road and easily missed. Hugh Morrison, 19th century photographer and early mayor of Woodstock, Virginia will be the subject of the May talk that Frank is planning for our library. Our speaker will by John Adamson of the Strasburg Museum. 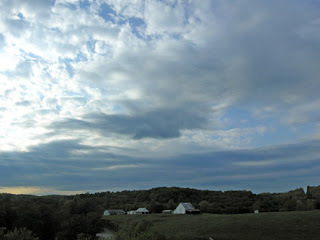 Saturday May 26 at 10 A.M.
One of the things I can't help noticing when we drive in our part of Virginia is how green the farms are. I took these photos today along Orkney Grade near Kelly Road. Frank has selected George Washington University as the place to have his surgery. Here's their page on this type of robotic surgery. It's scheduled for mid-June. Frank said "Look at the sunset" so I picked up the nearest camera and stepped out on the deck. Unfortunately, it was his old digital camera and sometimes the lens cover sticks. I didn't notice it immediately because it's not an SLR. But actually that adds something to the image. I flicked the stuck shutter with my fingertip and it slipped back into place. Below is the corrected version. My old dog Guppy is back on phenobarbital for seizures. He had two seizures yesterday, and the second one was rather severe. He fell over on his side and started shaking uncontrollably. After it was over he acted disoriented for a while and finally was able to get back up. I called the vet this morning and he prescribed the medication. Gup took phenobarbital before but his seizures then took a different form, basically compelling him to dash around frantically eating lint and plants and even small objects. After a number of successful months on the medication, I weaned him off it, instead not feeding him any "Greenies" or chicken. This worked well for a long time (about a year). I based that approach on reports that dogs were swallowing the green chew-snacks without chewing them, and one book that said some people suffer seizures after eating chicken or eggs. Lately my dog-feeding routine has been complicated because his buddy Ben gets sick after eating many different dog foods (and many human foods too). The only foods that I'm sure don't make Ben sick are hyper-allergenic kibble made with duck and potato, goat milk, eggs, and chicken. So I was buying a different dog food for each dog. Then Guppy lost his appetite for his lamb-based dog foods and was losing weight. He does not lick the duck and potato kibble - frankly I don't blame him. Yesterday I decided to give him a little piece of chicken to see if he tolerated it. He loved the taste but later in the day he had seizures. This could be a coincidence but he won't get chicken from me again. Tonight Guppy seems okay but he keeps hiding in different places. Perhaps the seizures frightened him and he wants the security of shelter. Right now he is sleeping in a small spot between a chair and a wall. 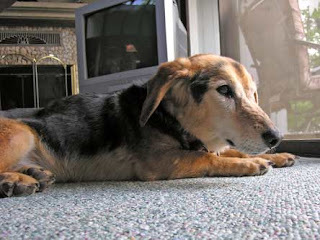 Click for Seizure Disorder in Pets article. Last Saturday I took Frank's sister shopping for a souvenir. We went to an antique store next to the Shenandoah County Landfill but didn't find anything to buy. However, it became clear to her that she really wanted a small piece of artwork depicting a local scene. I took her to The Art Group in Mt. Jackson but they did not have exactly what she was looking for. I then drove her to New Market and we browsed a few nice shops. She purchased a picture of a lion but still did not find a local scene that suited her taste. Eventually we did find the right piece at Oasis Gallery in Harrisonburg. She selected a print showing a horse and carriage in front of Fort Harrison. I was glad to find this gallery; it a little gem: attractively laid out and with a nice selection of artwork. It is on Route 11 northbound on the corner of Water Street. 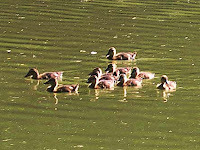 The Carrier Arboretum on University Boulevard in Harrisonburg has a pond filled with ducks, turtles and fish. We stopped there for a brief visit on Sunday and were entertained by this flock of little ducks. Bryce Resort - Drive through the valley on Resort Drive, always pretty with the golf course surrounded by mountains. Take Route 263 (Orkney Grade) to nearby Orkney Springs, a charming resort town out of the 19th century. 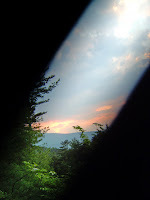 Don't miss Shrine Mont's outdoor cathedral... if you can find it! Return to Basye, maybe stopping at the diner for lunch. 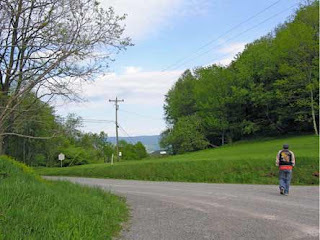 Then turn on Alum Springs Road and head into the country, noticing the old stone furnace on the left. After a few miles you'll see the Mennonite Church on your left. 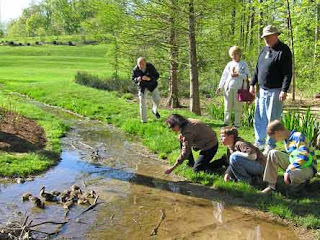 Turn right onto Crooked Run Road and drive down to see Deauville Deer Farm. Return to Alum Springs Road and continue out to Jerome. Drive up into the church parking lot for a lovely view. 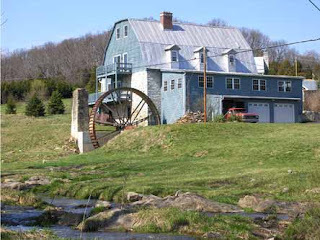 As you leave the parking lot and turn left, make an immediate right and follow 717, pausing at Liberty Furnace to admire the scenic little mill. Eventually 717 puts you on Wolf Gap Road which bears right and takes you to Columbia Furnace. Here you can either return on 42 or take the extended tour below. 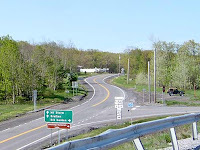 Where Wolf Gap Road ends at Columbia Furnace, you can turn left instead of crossing the bridge to 42. Turn left again at the church onto Back Road (623). 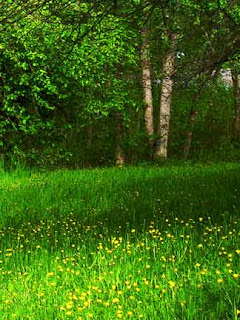 Enjoy the ride through the gentle hills and green fields. After passing through the quaint town of Mt. Olive, turn left on Battlefield Road. 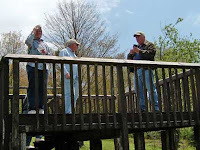 This takes you to Fisher's Hill, where you can stop at the Civil War site and walk out to the sign or all the way up the hill if you are so inclined. 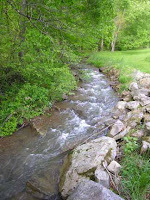 Continue through the town of Fisher's Hill, but slow down as you cross the bridge and look back at the scenic mill and creek. 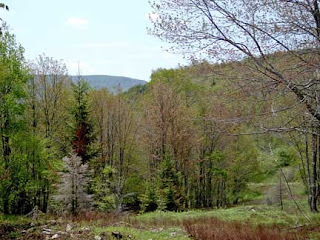 Then bear left and continue to Route 11, the Old Valley Pike. We turn right on 11 and make our way back to Orkney Grade Road, passing through several towns and stopping at the old mill in Edinburg for a few minutes. Antique lovers may want to stop at one of the shops on U.S. 11, and there are also various other stores if you want to spend some money. Have fun!